Seven-time Formula One world champion Michael Schumacher still can’t stand up or walk on his own after a December 2013 skiing accident left him with a cerebral hemorrhage, reports The Telegraph. 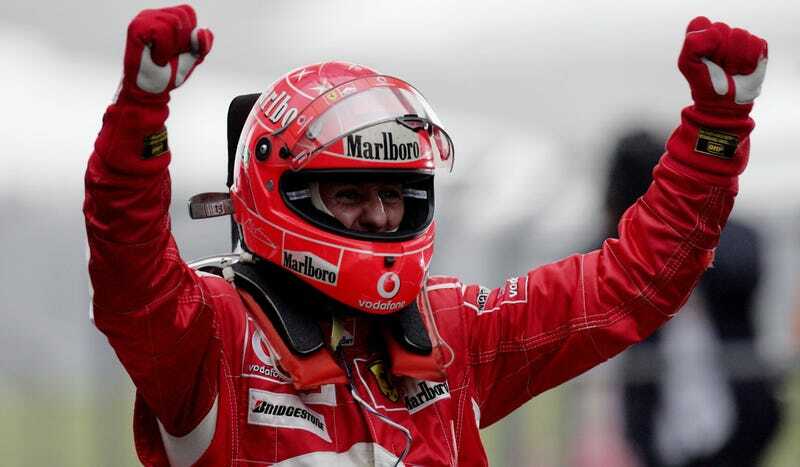 Schumacher’s condition was disclosed in court proceedings for an invasion of privacy lawsuit filed by the Schumacher family. Schumacher’s family sued German magazine Bunte for reporting that Michael could walk again in a major cover story. You can see that cover boldly claiming “He can walk again” here. The suit was for invasion of privacy, seeking €40,000-€100,000 ($44,667-$111,667) in restitution. “He cannot walk,” Felix Damm, a lawyer representing Schumacher, told a court hearing in Hamburg. The five-time world champion cannot even stand without the help of therapists, Mr. Damm added. The family has been very guarded of their privacy throughout Michael’s recovery, despite having to deal with Michael’s medical records reportedly being stolen and widespread speculation on Michael’s condition. Schumacher’s manager Sabine Kehm previously denied Bunte’s claims at the time of its publication, explaining to The Telegraph that such speculation is irresponsible, particularly because it gives false hope. The trial is expected to conclude in October.